A patch of unlocks and camera fixes is set for mid-December. 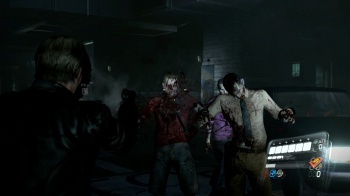 Upon its release, Resident Evil 6 didn't really seem to hit the ground running. Instead, players reported that the game seemed to spend most of its time QTE-ing through a misty, half-locked universe that you couldn't see properly because the camera was welded to the back of Leon's head. Developer Capcom appears to have listened to these concerns and, as a response, has announced the release a patch for Resident Evil 6 this December. According to the developer, the patch will do three things, two of which are already on-disc: It will unlock the previously-secret fourth story mode, led by Ada Wong, from the outset. Where before you had to complete the three other story missions before being able to play Wong's story, the patch means that players will be able to access that part of the game from day one. Secondly, the patch will unlock the game's "No Hope" mode, which is an extra-hard difficulty setting there for players wanting a bit more of a challenge. And thirdly, after hearing various complaints, the patch will include slight changes to camera control that should, hopefully, result in an expanded field of view during gameplay. From what these screenshots reveal, however, the change doesn't appear to be that heavy. It's nice to see that Capcom took player feedback on board and has attempted to address some of the players' concerns. While the biggest criticisms that most seemed to have of the game aren't going anywhere (what with the game being built on them and all), this patch could be a step in the right direction. A little step, but a free step.